Rituals of Râ€™hllor is the second monthly release in this new cycle, and the second Chapter Pack to adopt the versatile new collation format. While the Brotherhood without Banners remain loyal to the name of Robert Baratheon, Melisandre of Asshai has worked her way into the confidence of his brother, Stannis. Under her sway, a new, fanatical sect of zealots has risen to power within the fractured ranks of House Baratheon. Featuring the manipulative red woman Melisandre, as well as a wealth of synergy for cards with the Asshai trait, Rituals of Râ€™hllor will bring new deck-building depth to your A Game of Thrones experience. 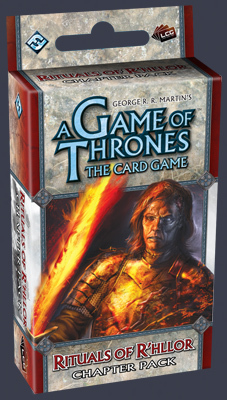 The never-before-seen cards in this expansion were designed to augment existing decks and add variety to the A Game of Thrones metagame.